DIYers have been urged to take care and be aware of asbestos. The Asbestos Education Committee and the Asbestos Diseases Research Institute have urged home renovators to be aware of proper asbestos safety procedures ahead of the official launch of national Asbestos Awareness Month on November 1. 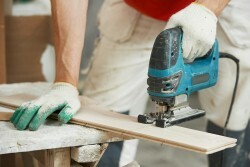 According to Asbestosawareness.com.au, a study published in the Medical Journal of Australia has found that more than 60 per cent of DIY renovators have been exposed to asbestos dust while working on their properties. Alarmingly, more than half of DIYers say their partner has also been exposed to asbestos in the course of renovations, while 40 per cent admit that their children have been exposed as well. Asbestos Diseases Research Institute Director, Professor Nico van Zandwijk, says that it is “vital” that Australians heed the warning regarding the dangers of asbestos, and learn where this harmful substance can be found around the home. “The number of people diagnosed with mesothelioma continues to rise despite the introduction of preventive measures in the 1980s,” said Mr van Zandwijk in a statement released October 17. “For every mesothelioma case there are at least two lung cancer cases caused by asbestos, and for all those diagnosed with an asbestos cancer, the realisation that their disease might have been prevented simply by managing asbestos safely, can be heartbreaking,” said Mr van Zandwijk. Of course, DIYers are not the only people at risk of asbestos exposure. In fact, people working as tradesperson in industries such as plumbing and carpentry are at particular risk of being exposed to this deadly substance. For these people, health and safety training regarding the proper management and disposal of asbestos is not just a luxury, it is a necessity that they cannot afford to disregard. National Asbestos Awareness Month will run throughout the entire month of November, and will serve as a timely opportunity for Australians to think carefully about the way they are handling material that potentially contains asbestos.